Do you want to find happiness in your career and discover your purpose and passion? The irony is that it isn’t something you need to search for. The whole concept of trying to figure out what you are passionate about or finding a shortcut to your right career path is really about stepping into your calling to be the best you can be. This means creating the best work you can do. Being as productive as you can be and serving others by sharing your gifts with the world. But I know I wasn’t thinking about serving the world when I was desperately job searching to get out of my stressful job because I was absolutely completely wrapped up around me, me, me. I was so wrapped up in trying to figure out what I should do and figuring out how I was going to make ends meet. I was so wrapped up in looking for a job so I could get a paycheck. I was so obsessed with trying to be happy in some job out there on monster.com instead of realizing that I had a true calling that was already inside of me. Then, I was unhappy because I was holding myself back because job searching morning and night was not my calling and was not how I serve people best. Instead, it made me want to go crazy! Are you there too? How do you get out of that? How do you get out of the stress because you do need a paycheck and a job to pay your bills but you also want to find your passion and purpose? This is very tricky for most people. Here’s the great news. You can transform. I have. I was a frantic job searcher who didn’t know anything about passion and purpose. I thought you go to college, get your degree, and then go into the field you got your degree in. Then you get paid with a paycheck and just keep working hard year after year. I didn’t know I would have so much stress and anxiety when I first became a financial analyst because that’s what my degree was and my college advisor said I would be good at. So I became obsessed with this entire process of just finding a job to make ends meet and paying my bills. Anything would be better than where I was stuck in my draining job. I am sure you can relate to that. The great news is that I was forced to learn how to find my ideal career fit and develop myself personally and that same personal development process is available to you. When I learned that I had interests, gifts, and talents that were unique to me that I realized I loved doing, I realized who I had to become to be able to be that woman to make the leap and step into work that made me happy. Fast forward to today and I have found that “sweet spot” where I want to go to work and where I am serving others and completing my calling at the same time. All this because I took the focus off of me looking for a job to make ends meet and instead trusted that God had a perfect plan unfolding for my life and my highest good. Only you can be you and your most important “job’ is to be you the best “you” that you can be. A dream come true. Working with my husband. 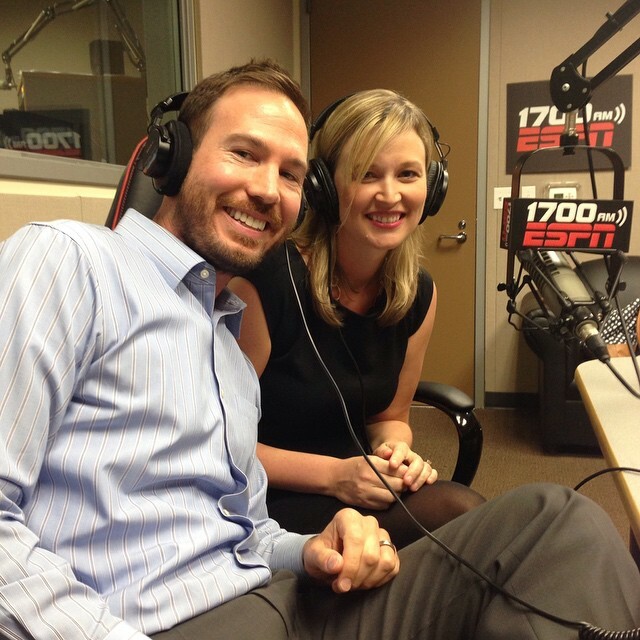 This is our first radio interview on ESPN 1700. Your purpose, passion, and calling is not something that you are going to find one day while job searching. Jobs come and go, but your calling is for life and cannot be taken away. The best way to do your calling is to start evaluating how you can serve with your gifts and talents you are aware of now, having faith and surrendering your stress and career anxiety into God’s hands. This is all available to you if you allow your relationship with your work to change. Start being in service to yourself by taking care of yourself and start serving others with your talents. Not only are you bettering your life as your transform your mindset and career but you are bettering other people’s lives such as your clients, customers, bosses and co-workers and even your family and friends as you step into your calling of your life. It’s not something you have to search and search for. It’s within you. The best way to find your passion and purpose is to be 100% you and to be your best self and then your calling will start becoming more evident. I love the saying: Do what you can, where you are, with what you’ve got. When I realized that my best self was when I was teaching a group of employees on anything, even topics I hated, I looked for more ways I could add “training’ to my role as a financial analyst. I volunteered to lead the training team and to teach a course for new employees on how to navigate their career in my spare time. From there, my true calling emerged. My life purpose is to help other women find careers they love. That was me serving with my unique talents and skills and doing something that fulfilled me that I could wake up super excited about. And day by day, it became more clear as I tried new activities like blogging ( I used to hate writing when I was a kid – I thought I was terrible!) to public speaking (umm..introvert here that doesn’t like to be in front of people). All these things I “thought” I didn’t like and wasn’t good at suddenly started to be part of my calling and purpose as I explored how I could be my best self and how I could serve more people. Another dream come true. Speaking internationally to 800 women in Brazil (Sep-14). 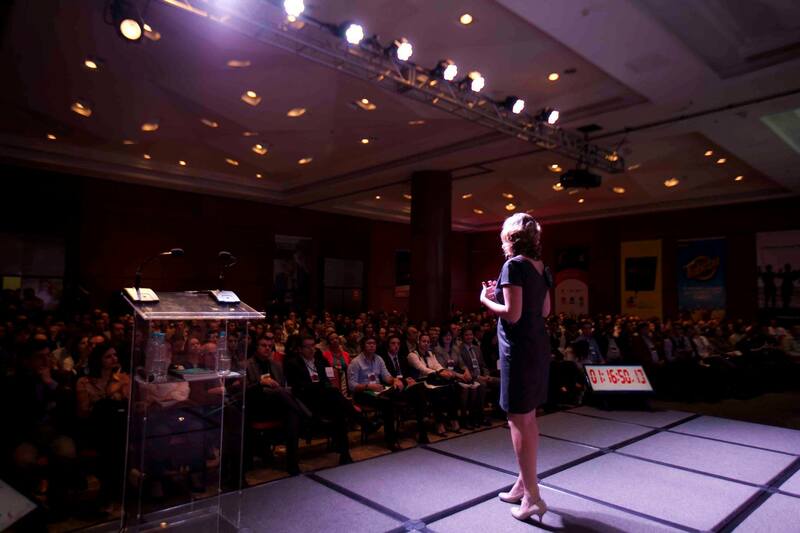 Yes, speaking scares me, but speaking to 800 women in Brazil a year ago was a life-changing moment when I realized everything that this was my calling! I had done everything I could up to that moment to improve myself and patiently wait for my calling to appear while I focused on tasks that made me happy. Each and every opportunity that has dropped in my lap like speaking internationally, signing a book deal and getting featured in magazines. It’s not something I pushed for. It just happened effortlessly. That’s what happens when you are focused on your purpose and calling – and not searching for a job. Instead, it’s just every single day doing a little bit of what you love and growing your strengths and talents even though you aren’t getting a paycheck from them yet. Even though I had a full-time job I hated, I would work on my little blog every morning and be so excited to wake up and do that even if it was just a few minutes in the morning. My work and calling has now impacted hundreds of women’s careers and lives. It’s kind of startling to think about who I used to be and all the lives that wouldn’t have been touched by me had I not become totally available to be used by God everyday and totally available to overcome my fears and get out of my comfort zone. I raised my hand and said I am available to overcome my insecurity and will stop playing small and not achieving my true potential. I let go of the “Who am I to be a successful career woman?” thoughts each of us has faced. Each one of us is meant to be successful in whatever career we want. It is possible. You don’t have to “know’ or “find” your calling right now. The key to overcoming your fears and finding your ideal career target is to focus on what you do best. What do you do best that you are going to focus on daily to be your best self?